What does it mean to be the chief of both the Department of Social Medicine at Harvard Medical School and the Division of Social Medicine at Boston's Brigham and Women's Hospital? For Jim Yong Kim, 46, it means trying to solve some of the world's most difficult problems. Ten years ago, Kim was working in the slums of Lima, Peru, with a team of doctors from the charity Partners in Health, based in Cambridge, Mass. They encountered an epidemic of drug-resistant TB. Experts had long agreed that it was impossible to treat this disease in such a setting. Kim and his colleagues proved the experts wrong. Moreover, Kim led a campaign that forced down the prices of the necessary drugs about 90%. 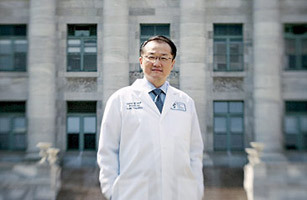 Since then, 36 countries have adopted the protocols Kim and his colleagues devised. "If we can do this with drug-resistant TB, why not with AIDS?" Kim said to me when I first met him. In wealthy countries, AIDS has become a treatable disease. But in what is euphemistically called the developing world, millions still die from it every year, and only 300,000 were being treated as of 2003. Working for the World Health Organization, Kim created a campaign to increase the number treated to 3 million people by 2005. He called the effort 3 by 5. An impossible goal, many experts felt, and they were right. But by 2005, more than 1 million new patients were being treated, and the total in Africa had increased eightfold. In the high councils of international health, the 3 by 5 campaign was, as Kim put it, "like a bowling ball thrown into a chess match." Officials who two years ago were arguing against universal treatment for AIDS now say they were in favor of it all the time. One of his students told me that Kim was his most inspirational instructor; he made you believe you could change the world. I have no idea what he'll do next. But looking forward to it gives me a sensation that feels a lot like hope.